DIY Video : How to build a Simple and Efficient Homemade Water Distiller for cheap .Great for everyday use or in emergency/off-grid situations. This Video shows the build of a Homemade Compact “”Counter-Top” Water Distiller which literally cost me nothing to make.It’s made with items commonly found around the home, so for many people, it’s free to make.This Unit Makes Water Fast!.The TDS (total dissolved solids) in the water used was 575-638 ppm. The unit will purify just about any dirty water and works great for converting saltwater to freshwater.No electric power? 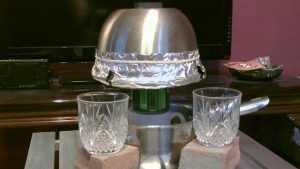 use propane stoves, rocket-stoves, campfires, parabolic dishes… anything to get the water boiling.Only use Heavy Duty foil for the trough and make trough as smooth as possible for the best water flow. cooling the “condenser bowl” with cold cloths increases water production dramatically.